The challenge is to exchange all kinds of data, in all directions, in all languages, with all cultures, by all means, using all kind of devices, in all forms, according to all protocols, oldest as newest, selecting, filtering, protecting data and ensuring the source/sender and destination/receiver, human or others. In an open, connected and mobile world, we have moved far a way from the structured and hierarchical databases with their specialized related bloc of software, managing and processing informations purely internal and closed on themselves. But at the heart of the organization, trades and processes of the company, real backbone and repository of historical data of the companies, the business, it is difficult and probably suicidal to want to abandon them, to do without them. The question is : how do I go from one model to another to build on an existing while entering the future or exchange with others having a different model? 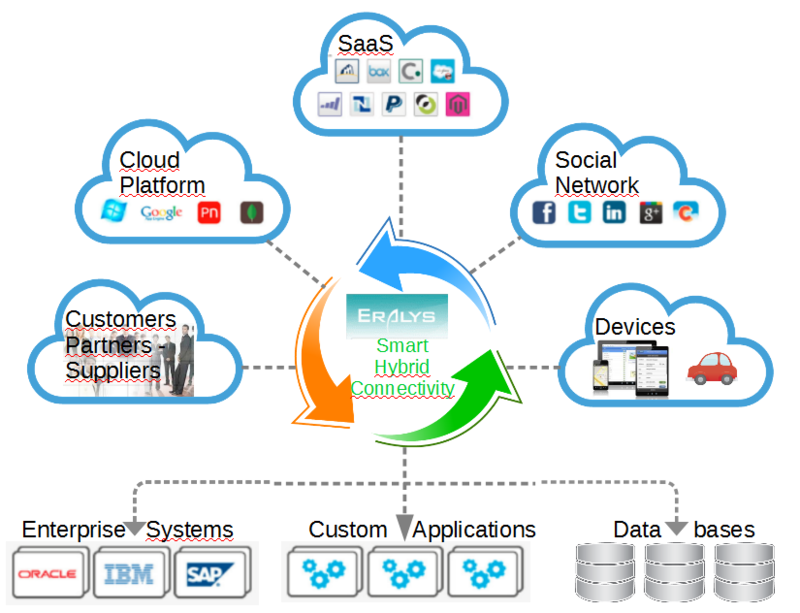 Just plug to Eralys Smart Hybrid Connectivity services platform.